One of the best phones from 2016 is having an unprecedented and rather annoying issue: the Samsung Galaxy S7 Edge has been reported in what looks like hundreds of cases of a thin pink vertical line appearing down the right side of the display. Is this a result of the Nougat update or a hardware issue? 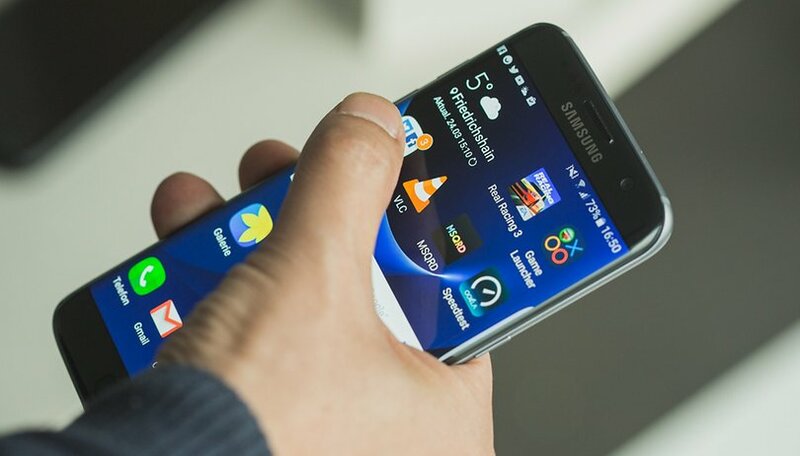 A mass of Samsung Galaxy S7 Edge users have been complaining across multiple forums and websites, including the Samsung support forum, Twitter, Facebook and YouTube, that this display issue suddenly occurred out of the blue, where the phone had not been dropped, nor had it been in contact with water or tampered with in any way. So far, Samsung has not yet issued a statement confirming whether this is a widespread issue that the company will be looking into, so you’ll have to stay tuned to find out if this occurs at all. Until then, it might not be worth sending your phone in to be fixed by a Samsung technician. Not only would it take days or maybe even weeks to fix, the repair just might not be covered. Also, seeing as the Android Nougat update just started rolling out recently to the Galaxy S7 Edge, it would be interesting to see just how many of these disgruntled owners have already received the update and if this could be a possible cause. Recently, the update to this device had been halted in China because of some bugs Samsung had noticed. Could this have been one of them? That being said, some users and certain savvy members in forums are suggesting that the issue comes from the LED itself and that it is a hardware issue. In any case, it is frustrating for a relatively new device to be facing such an issue. If you want to send in your device, that is up to you, but in the meantime, you could try a couple things at home first. For one, you could try resetting the display in the service menu. Like on all Samsung devices, type in *#0*# into the dialer pad. A word of warning on this, be careful once you enter the service menu to only access sections when you know exactly what will happen. For this situation, to reset the display, tap on Red, Green and Blue. If it doesn’t work the first time, try a few more times. If this is in fact a hardware issue, a second option also shared among the forum-users is to lightly press down on the upper part of the screen below the camera lens / Samsung logo. For further assistance from Samsung support, you can give them a call at at 1-800-726-7864 in the US. Warranty information about your phone can be found here for the unlocked model. You can also check in with you carrier to see what repair or replacement option it might offer. Let us know if you have this problem and if you have an alternate workaround solution you could offer fellow Galaxy S7 Edge users. Samsung S 7 edge Downloaded new software update yesterday and within 12 hours My phone now has a pink line at right edge running down the screen. Has an armoured case and hasn't been dropt so I think there is a problem with this update. Phone out of warranty and update was automatic when connected to wi fi . Bemused! I had the same problem with the vertical line on my International Galaxy S7 Edge. I tried the fix involved with dialing *#0*# and then tapping on Red, Green and Blue; however, that would always just be a temporary fix for me. The pink vertical line would just reappear within hour for me. I ended up finding another solution on another forum which actually seems to have resolved the issue for me. Its been more than 24 hours since I performed the fix and still no vertical line. What seemed to have resolved the issue in my case was to install the "Pixel Fixer" app from the Google Play store and let it run for about a minute on my phone. I have this problem now it only started when i did the update a couple of days ago am going to phone Samsung in the morning. I had a similar issue with my 7 Edge only the line was lime green. Samsung replaced the phone and based on comments from the people who handled the replacement I got the impression that my situation was far from unique. I heard comments like "oh yeah, that" when I would start to describe the problem. They asked if I had dropped the phone. "No" was my answer. That one basic question seemed to be the jump bar for getting it replaced. In the end I was told the problem is with the digitizer (whatever that is) going bad. In my case the line first appeared about six months into ownership. A few weeks later it was back for a day or so. The third time it appeared it never left the screen and was a bolder line than before. I had taken pictures of the screen (screen grabs don't capture the line) and had brought it by my T mobile store to make sure someone else saw and documented the issue. When the line came back and refused to leave my request for a replacement was handled right away. I've had a month with the replacement. No issues so far. I hope I can say that when six months comes around. I had this issue about a month or so ago. At&t. I did the *#0*# temp fix. Then I press on front camera lightly till it goes away has not come back since. 3 weeks strong I hope they address. Cause I really wanted note 7. Now gotta wait till April. Samsung better get on addressing this issue or I'm gonna get the pixel. I have this problem. It does disappear intermittently. But I should note, none of the articles points out that on Verizon, the *#0*# fix is invalid. It treats it as a phone number, which doesn't work. this is most definitely not related to nougat update. my wife and I both got s7 edge phones through Verizon in July of 2016 and around November my wife's phone developed this very issue. luckily we pay for the insurance and I was able to take her phone to Verizon and had a new one a day later. so far I have had no issues with mine and her new one has been fine. by the way not sure if it matters but she had the original black colored edition and I noticed all the ones shown in images above seem to be that black version. Having this problem since last month. Have yet to send for repair. Definitely not caused by Nougat and yes, pressing on the top part help temporarily. Then it just comes back. Most likely it's hardware problem. Had my s7 edge since May and only got this problem after using it on Gear VR. I believe it's the heat that caused this problem. My phone had never heated up as much as its being used for VR.